Historically, the advertising and editorial departments of news organizations are supposed to be walled off from each other. But that wall seems to be crumbling in a way we could not have imagined fifteen years ago. It may be unintentional, but it’s still a little weird. I should note that I don’t object to websites selling ads. They need to make a buck, I get it. But it used to be that in the days following a crash, airlines would pull their commercials from broadcast media. Perhaps this was out of respect for the grieving, but more likely it was an attempt to become invisible at a moment when so many potential passengers were witnessing their worst nightmare on the evening news. Thankfully, it has been so long* since the US has experienced a major airliner crash, I don’t know for sure what the policy would be today. Admittedly, a lot of the tornado videos were commercial-free, but I have been struck recently by how often online news segments about limbs lost to sharks or children gone missing are preceded by pitches for cars, trucks, and assorted pharmaceuticals. In his fascinating book “Amusing Ourselves to Death,” the late Neil Postman, the media and social commentator (http://en.wikipedia.org/wiki/Neil_Postman) , describes a typical evening newscast in which the anchors intone gravely over video of famine victims in a far-off land. As the story concludes, the only reasonable response would be to pause for a moment, heads shaking, to ponder the inhumanity. Instead, the anchors immediately smile and say cheerfully, “Bruce will have Big Board Sports when we return after these messages.” Cut to commercial. Advertisers must believe that the micro-interval between the heart-rending famine video and the ad showing a happy Mom with her kids at a fast food restaurant is long enough that their brands won’t be sullied by proximity. And after a mind-numbing Labor Day “Sale-abration” commercial, one suspects that the famine images have long since vanished from consciousness. But when the ad is placed before the story in such a way that we can’t actually view the story without viewing the ad, how can we disassociate the ad from the story? And if that’s true, why would advertisers find that acceptable? 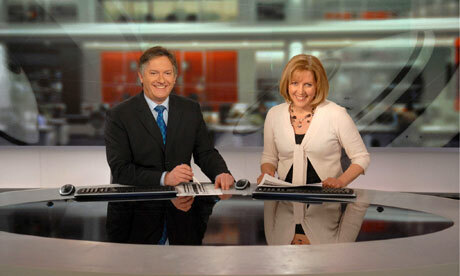 One answer could be the newsroom cliché, “If it bleeds, it leads.” Car wrecks draw more clicks than walk-a-thons. Grisly murders outgun spelling bee champs every time. Advertisers may have more tolerance for being attached to a disaster simply because their ads will likely be seen by more people — that’s what makes them happy. And nothing makes CNN happier than happy advertisers. 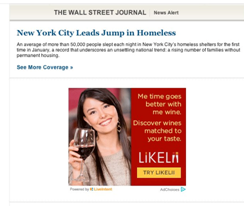 This surely is a “What the hell were they thinking” pairing: an ad extolling a better lifestyle that includes drinking wine — directly under a story about a big jump in homelessness. It is unlikely that the placement was intentional — just incredibly unfortunate. I’d like to believe that the folks at Likelii were unhappy about it, too. But who knows anymore? 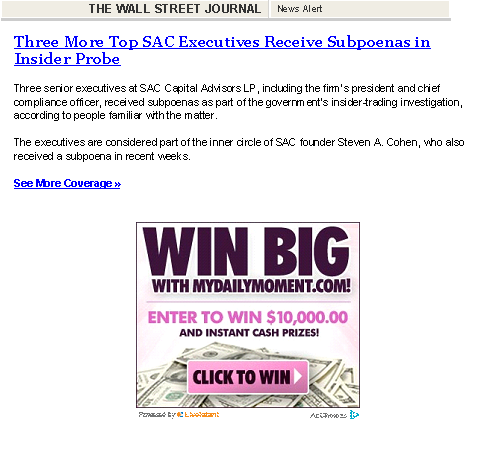 And if it were my investment advisory firm that was being investigated for possible insider trading violations, I might not appreciate having readers reminded that my goal at all times was to “win big” — at any cost? This is not something I noticed myself in particular but one thing we’ve discussed in an IT class I took was that this transition from face-to-face communication to online communication seems to have taken a toll on our ability to empathize with one another when it comes to tragedy or loss. What often ends up happening is people leave a comment on some social media site offering their sympathies or condolnences and that’s the end of it. No mention of the tragedy ever again. I think this goes hand-in-hand with the advertisement craze you’ve noticed. Oh the transition our world is taking is quite scary. I think there is a lot of truth in that. Thanks for commenting, Angela.